Refurbished in the last few year, this fabulous house now benefits from a new kitchen with bespoke doors, new oven, hob and extractor, new carpet to bedrooms, hallway and stairs, new designer headboards, new bedroom furniture, new wood flooring to ground floor, new wall mounted flat screen HD TV, new tiled floors to both bathrooms and new dining furniture and new sofas. 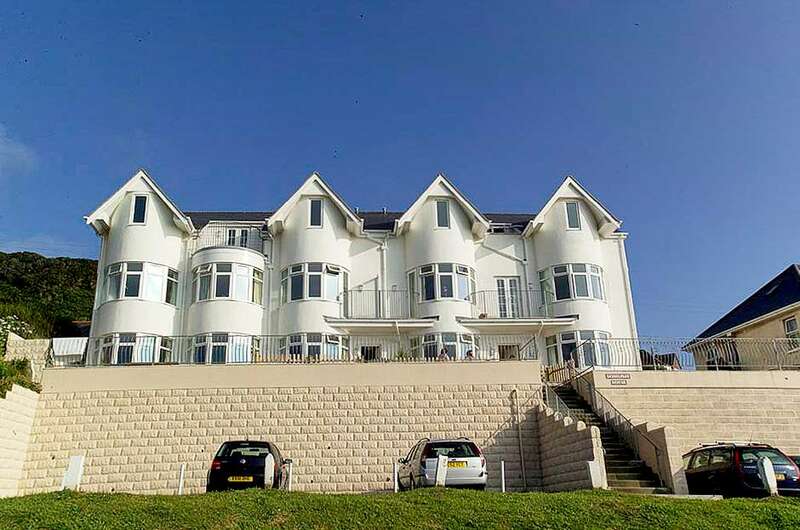 Crossways Court stands majestically overlooking Combesgate Beach just a ten minute walk from Woolacombe village centre. No 3 is a two-bedroom house with enviable views! The stunning new main living space incorporates the sleek new grey kitchen at the far end and has a great sized living room with a huge bay window overlooking the sea. With parking, outdoor area to enjoy the view and just a walk across the road to the steps to the beach; this property is very popular with families. On the first floor there is a double bedroom with full en-suite facility and a small twin bedroom also boasting its own en-suite shower room. The twin room has no clothes hanging due to space limitations but has a chest of drawers. There are full length curtains in the master bedroom and blinds in the twin. In the living room the "L" shaped sofas can seat 6 people comfortably. There is a wall mounted HD TV, and Wi-Fi. Bookshelves with books, games, tourist info leaflets and instruction manual for appliances are in the dining area of this large through room. At the far end of the room the well equipped kitchen has 50/50 fridge/freezer, a full size dishwasher, washing machine, microwave/grill, oven and hob. This fine holiday home has bed linen & towels included in the price and has all modern conveniences. Please note there are steps up to the property. Early booking advised. Linen and towels inclusive. Heating and water inclusive. Sorry no pets. Saturday changeover. A security deposit of £150 is pre-authorised and then released after the holiday.